I’ve missed seeing your whimsical fun pieces. This is very light and airy, just the way a balloon piece should be. i love this one, linda. it looks like confetti of your thoughts, with peeks of sunshine all over the place. 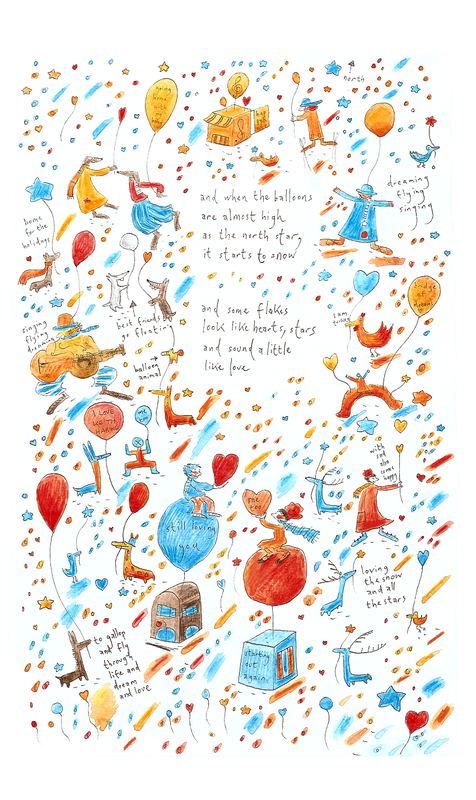 Such a lovely balloon world and I like the flecks of colour. Oh, the deeper colors! The movement! It’s a celebration! Of life and love. Like Aimee said, it’s confetti and sunshine. Linda, you have such great illustrations/poems! This one is so fun! Who doesn’t love a celebration! I love the little details! Oh, I want so much to be there – in the picture! In your magic world of love, music and dreams. I admire your work! I’m so glad you followed through with the balloon prompt!